Distributed ledger technology //DLT// or Blockchain is a digital registry which is a decentralised, shared and tamper-proof technology. This peer-to-peer network was a result of Bitcoin but the technology has now moved beyond cryptocurrencies and it is widely used in the Bank and Fintech industry. It is in fact not such a complex technology and to put it simple, Blockchain is a set of highly scalable records referred to as blocks but with the potential to create new complex and innovative solutions. GAFAN > Blockchain > Football 2.0? Industries are constantly challenged by their environment and the emergence of Blockchain is driving us to think differently of how technology is affecting our lives, since it is advancing even further than how GAFAN already changed our world. The concept of data management and its storing, updating, security and costs are being disrupted, potentially solving issues of copyright, protection, trust and integrity. In the world of football, despite some limited size initiatives for the time being, there is a lot of potential that can be explored beyond the simple use of digital money or trusted data movement and storage. Recent risks related to betting or hackers using a crypto gambling ring (neither legal nor illegal though) during the World Cup causes some additional reflection on how to approach this. Blockchain for football or 4.0 industrial revolution? 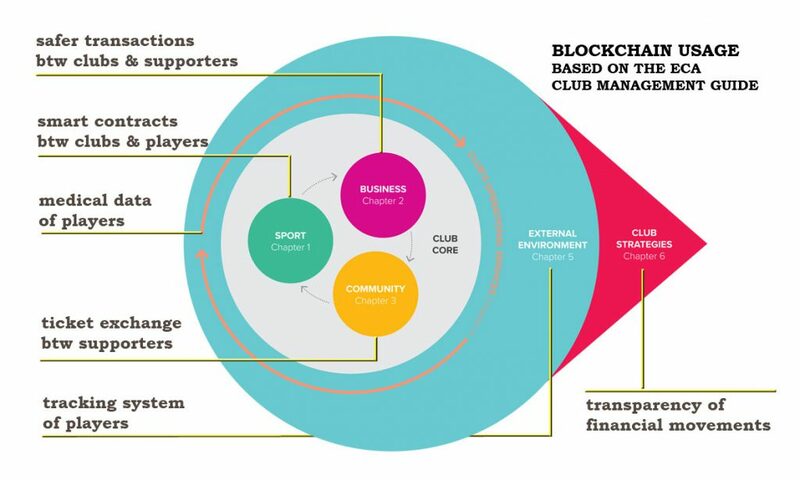 While reading the revised and augmented version of the ECA Club Management Guide from a Blockchain perspective, I was amazed of the many concrete applications that could be used and further discovered within football! Chapter 1/ In the sports area, with smart contracts a player could be paid directly according to his performance, executed automatically any time conditions are met. Alternatively, for instance supporting football players with limited financial means, such as women’s players, through crowdfunding could substantially help the development of for instance women’s football and increase the performance of women’s clubs. Chapter 2/ In the business field, granting safer transactions between clubs and supporters, would keep personal data guaranteed in line with GDPR regulations. Chapter 3/ From a community approach, allowing fans to easily exchange tickets ahead of games or allow season ticket holders to rent out their seat for separate matches in a safe manner would eliminate the black market and could increase attendances. Chapter 4/ On operational level, sensitive medical data of players could be exchanged in simple, fast and secure ways between clubs and FA before the release of players which would solve a recurrent issue. Chapter 5/ Within the football governance, we could implement a tracking system for players (Player’s ID) for reliable monitoring, to store data such as payments, performance, or past injuries. Thinking ahead, this could be efficiently used in Youth football with a system of kudos that could be implemented where clubs that develop players receive direct rewards, solving to a certain extent the issue of FIFA solidarity payments. Indeed, like the Diamond Blockchain Initiative used by the mining industry, monitoring would also efficiently hit hard on slavery behaviours. Chapter 6/ On strategy and change management, just like the UN Blockchain Ethereum Syria Initiative, by allowing direct payments of players we could prevent human errors or eliminate the middlemen and therefore avoid double-spending as traditionally, third parties inflate transaction costs. We could also let track allowing transparency of financial movements to actively limit payments under the table. Our world is heading toward a more decentralised approach where collaboration and incentivisation are driving the ecosystems. I am thrilled by the idea to see how Blockchain is allowing us to imagine how many new domains that still can be changed, improved and applied to football. Perhaps there is some truth in what they say in the Blockchain studies, that this is one of the final parts of digitalisation of economic life? Or, as the Harvard Business Review pointed out last year, this development will lead to the extinction of “Intermediaries like lawyers, brokers, and bankers might no longer be necessary”. In the end you can do all of these without blockchain, however football will miss the point of security on a distributed and cryptographed system. The traditional systems are protected with firewalls and such third party solutions are required. Blockchain doesn’t need any of that, it is sort of like the next generation database. There is a fundamental question about the whole philosophy of blockchain. It is built on increased transparency, but the football industry generally thrives on opaqueness and lack of information. Can this paradox be overcome? Or will the football industry choose not to adopt blockchain because of that, and eventually lose out in the technological development stakes? 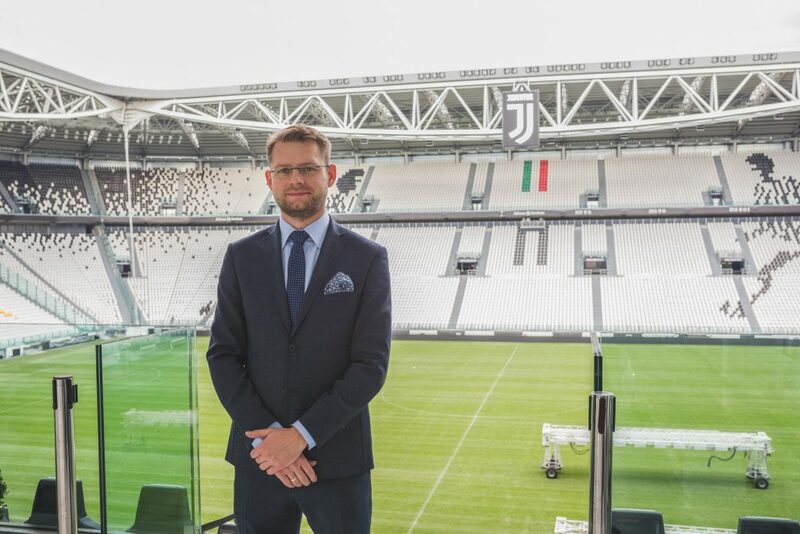 Olivier Jarosz is Professor at The Football Business Academy, where he will provide direct application of the blockchain technology to football in his course dedicated to Club Management. Follow him on Twitter or Linkedin.